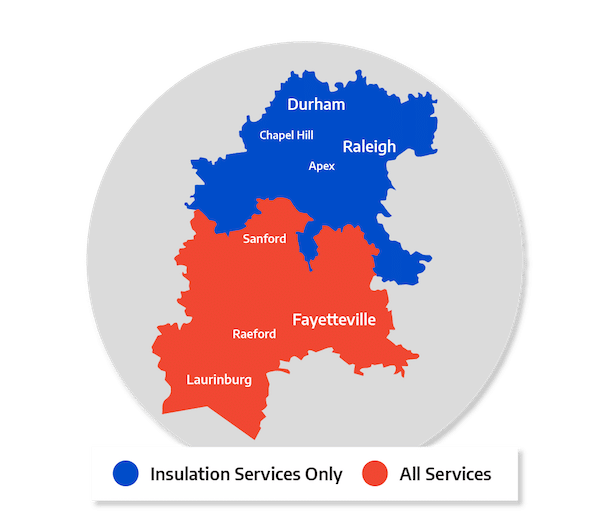 Home Energy Learning Center | Comfort Services, Inc.
As your local energy experts in North Carolina, Comfort Services, Inc. is here to help you make your home more comfortable and energy efficient. We provide a complete range of home insulation and HVAC services to help you solve your home's problems. There are many factors that influence energy efficiency and home comfort, as well as key reasons to improve your insulation and heating and cooling systems. Click any of the links below to learn more about home energy efficiency, comfort, and health, and how we can help you fix your uncomfortable home in Southern Pines, Aberdeen, Pinehurst or nearby. Everyone wants to save energy and money, but it's not always easy to know how. Learn more about how we can identify problems in your home and provide you with quality solutions. If your home has poor air quality, it could easily cause health problems for you and your family. These solutions will help ensure that your home has clean, healthy air. An improperly functioning HVAC system can have a negative impact on individuals with allergies and asthma in the home. We can help you mitigate these problems with air quality and ductwork services. Many older homes were constructed with building products that contained asbestos, and that can lead to problems in your home. If you've had air quality issues or are beginning a remodel, we can help you ensure that your home is protected from asbestos. If you have a common problem such as cold floors, drafty windows, or uneven temperatures in the home, there may be a simple solution. We can help you understand the causes of energy problems in your home and provide you with a solution. Got a question? There's a good chance we've heard it before. Check out our frequently asked questions to get the answer for your home.